Old Dutch's famous Moscow Mule Mug is constructed of solid copper with nickel lining and solid brass accents, the made-to-last mug features a coating of resilient lacquer that resists tarnishing for lasting beauty and luster. The mug of choice when serving Manhattan's infamous Moscow Mule--a cocktail made from a blend of vodka, ginger, beer, and lime juice. I purchased these because it says they are dishwasher safe. However, upon receiving them, the tag on the cup says hand wash only. Are they dishwasher safe or not? BEST ANSWER: Thank you we will look into this to confirm. Where is it made and is it non toxic? 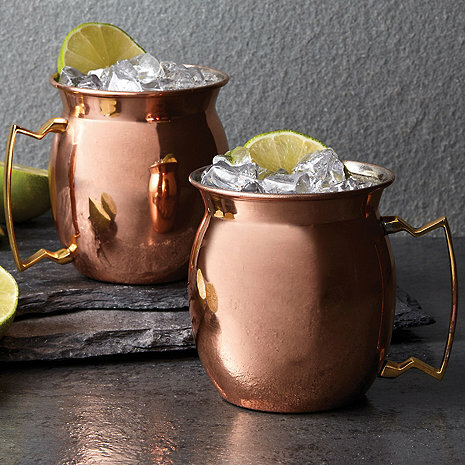 BEST ANSWER: The Copper Moscow Mule Mug 16 oz (Set of 2) has a nickel lining to prevent copper from being released into drinks. Please only hand wash these mugs to keep them in pristine condition. This is the best all-around mug and has the right weight. I have had compliments from all my guests that have used them. Super nice, well made and proper gauge or thinkness. Seems like they have a coating to keep copper from turning and inside is stainless. They stay nice and chilly for at least a 30 minutes even in Miami. Everyone enjoys using them, gonna pick up two more. I think I caught them on sale but weâ? ?ll worth the full retail. Shipping took about a week. Bought as a Christmas gift, The recipient was very happy.